Stephen P. of Australia "I received the Atari 65XE on Monday morning Australian time which is 1 week since posted, very fast. Of course the unit is in perfect condition. 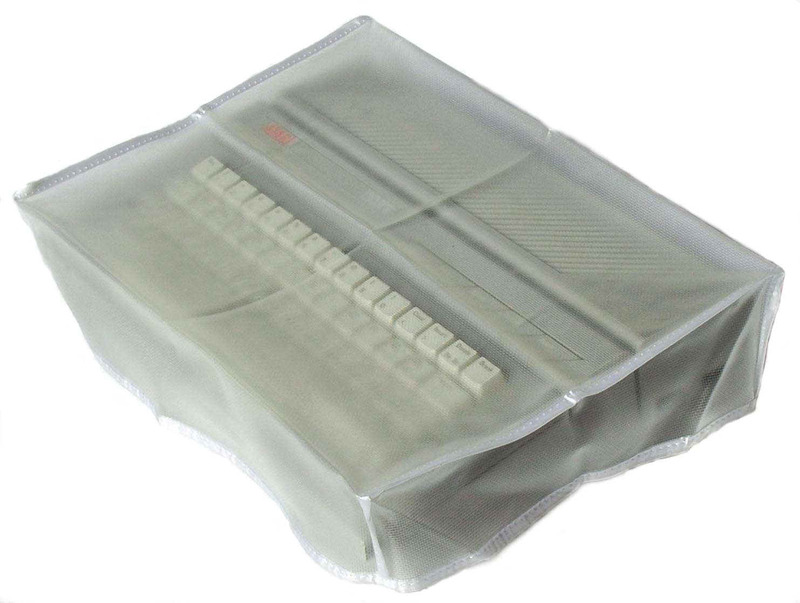 I would like to sincerely thank you for the excellent communication whilst working out my purchase, and I was blown away by the lengths that Your shipping department went to in safeguarding my Atari in its long trip to Australia, incredibly well packed to say the least." Marek S. of Poland "I received my New Best XE Keyboard Mylar CB101049 today. Really quick shipping to Poland - only 7 days! I've just installed new keyboard mylar and my 65XE works perfectly now:) Once again, Many thanks!" Gary G. of TX "Just wanted to follow up with you on this. Item arrived today. Really quick shipping! Works like a charm, Thank you for helping me save another Atari from the dumpster. I will definitely keep ordering from you in the future. Thank you again sir for a fine product !" Gary had an Atari 130XE computer with a bad internal XE Keyboard. He bought the Best Made Upgraded 130XE Keyboard internal replacement XE Keyboard Internal mylar (above #CB101049) . The stock Atari made 130XE single layer version Keyboard internal mylar (two different styles used over the years not interchangeable) has close to a 99% to 100% failure rate! The Improved Upgraded Best Internal XE single layer replacement XE Keyboard Mylar has a 1/4 of 1% failure rate last 25+ years of selling them. Jim H. of NY "I bought a Atari 130xe membrane last year from you and works great, but I have another Atari 130xe that needs a membrane as well. I took the keyboard apart and it is a MITSUMI membrane for sure, do you still sell the replacement?" Yes see the CB101049 XE keyboard mylar above. Atari Trivia Information / Question: Do you know what the Atari acronym A.P.C.D. and A.H.C.D. stands for? It was used on a lot of Atari paper work and Atari box labels (identifying the Atari products inside the Master cartons of Atari products stacked on pallets) on boxes of Atari 8 bit products in the early to mid 1980 Atari era. They stand for Atari Home Computer Division (Green strip across the label) and Atari Personal Computer Division (Red strip across the label). Back then the Atari Consumer division had the APCD then it changed to AHCD, and VCS (2600) departments. Robert M. of MI "It is amazing, that after 30 years these little 8 bit machines are still going strong and still have a pretty strong following. I have ordered parts and software from Best Electronics dating all the way back in to the 80's. I really hope you do not decide to suspend Atari sales, that would be a huge loss to the Atari Community. Every time I visit your site, I find something new, something I did not see before. I have often wondered what kind of treasures could be found in your warehouse." Follow up Comment: Thank you for your continued support of the Atari after all these years. 65XE / 130XE / 800XE The Best XE Touch (Formally called TT Touch for XE computers) Improved Silicone Cups that replaces the existing spongy / mushy feeling cups inside the XE Keyboard to give you a firm feeling keyboard with tactile feed back on each key stroke. XE Touch will only fit two out of the three versions / brand Atari Keyboards used on the XE Series Computers. If your XE keyboard DOES NOT have spring under each key cap, then you have the right XE keyboard that can be upgraded to XE Touch. All that is required for installation is a #0 Phillips screw driver. Full set of 62 XE Touch Contacts. CB102117 $19.95 Now a Must Buy for every 65XE / 130XE / 800XE system Owner! One of our German Atari Customers (Marc B.) was so pleased with his upgraded (with Best XE Touch upgrade contacts) XE Game System Keyboard that he wrote quick install guide with pictures on upgrading his Atari XE Game System keyboard (same basic XE keyboard used in the Atari 65XE / 130XE / 800XE computers). Here is English translation provided to Best Electronics from Marc, of that install guide that will be published in one of the German Atari Magazines. Boris K. of Germany. Boris read the different Atari reviews on Best's XEGS keyboard upgrade called "XE Touch". So he placed an Atari order for two set of XE Touch internal upgrade silicone cups for his two Atari XEGS consoles he had from Best. "I just received and already changed the XE best contact upgrade into one of my XEGS keyboards. This is really amazing, it turns this wobbly thing into an actual usable keyboard with a very professional feel to it. I'd say this is a must-buy for any XE owner - wow! Thank you so much for this! Danke! Best regards from Germany"
Paul W. of OR Paul ordered Bests XE Touch product, internal Atari XE Keyboard upgrade contacts, that gets rid of the mushy XE keyboard key cap feel and gives you a new Tactical feed feature on all of the XE keyboard key caps. "The XE touch upgrades are worth every penny!" Ben C. of TX Ben purchased one of Bests XE Touch keyboard internal upgrade contacts for his Atari 130XE keyboard. "The keyboard upgrade is great; the feel of the keys is much better than it was before." Jason H. of MD Jason had a bad (certain keys stopped working) Atari 130XE Keyboard. He ordered one of Bests better made XE internal replacement Keyboard mylars. Also Jason, had the right Atari 130XE Keyboard that would accept Bests XE Touch internal contacts that upgrades the feel (tactical feed back) of the Atari 130XE Keyboard key caps. "I received my XE Touch keyboard upgrade parts and the improved keyboard Mylar for my 130XE and installed them tonight. My keyboard works again and feels better than new." Boisy P. of LA "Got the stuff in today!" Boisy ordered one of Bests Custom made New 65XE / 130XE / XE Game Machine replacement internal Keyboard Mylar for a bad 130XE Keyboard he had and two of Bests XE Touch, Internal Silicon contact upgrade kits (for better tactical feed back on his XE Keyboard Key caps) for his 130XE and XE Game Machine Keyboards "The 130XE keyboard mylar works great, as do the new key cups. Night and day difference! Going to tackle the XEGS keyboard next... 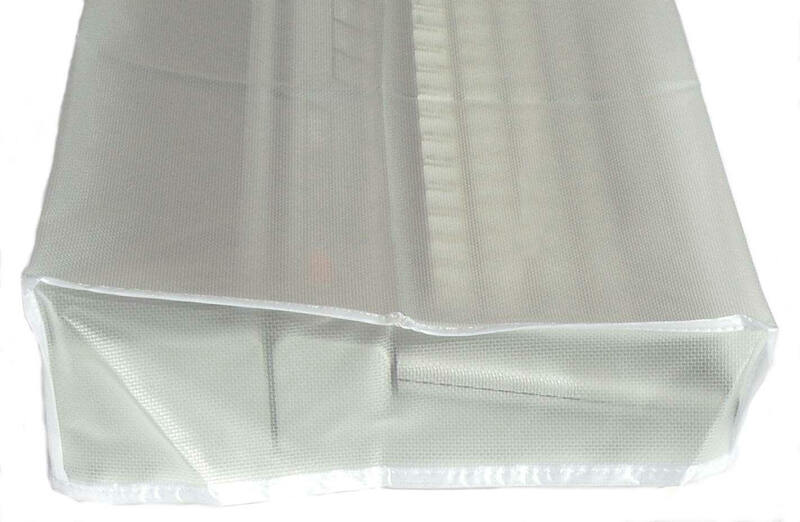 Thanks for very fast service and great products!" Lawrence P. of Canada "I'm very pleased with the Best XE touch upgrade. The XEGS is my favorite 8-bit, and I love that it has a detachable keyboard. The stock keys, are quite mushy and not fun for extended typing. My XEGS is pretty heavily modded, but this was one heck of a dramatic upgrade. I also thought it was a nice and smart touch to make the upgraded contacts red. Nice that it is impossible to confuse them with the stock ones during the upgrade. A subtle but nice touch"
Mark R. of the UK "Thanks for shipping the XE Touch kits." Best's exclusive Atari XE Keyboard Internal upgrade for the key caps. "I've fitted one to the keyboard of a European 800XE and it makes a world of difference to the feel of the keyboard when typing in programs." Kevin O. of SC "Thanks for getting that order out so promptly! Got the XE-touch keyboard upgrade installed in my 130XE's keyboard already.... never thought rubber cups made THAT much of a difference in the feel of a keyboard!" Bests new 65XE / 130XE / 800XE / XE Game Keyboard replacement Internal Silicon cups for a much improved XE Keyboard feel / tactical feed back. "It went from "barely tolerable" to "damn, that's nice" in like 15 minutes! If I ever get another XE, it's getting one of these kits too. Too bad people can't feel the difference online. I never realized how bad the stock XE keyboard was when I was a kid until I got another XE recently." Roy L of CA Earlier this year Roy purchased an Atari 130XE computer from Best to upgrade from he old Atari 400 Computer he was using for years. "I don’t care for the key action on the 130XE. If I remember right, you mentioned that the keyboard on the 130XE I bought from you is upgradeable. Is that correct" The Atari answer to Roy's question was Yes. Roy was referring to Bests XE Touch upgrade internal silicon contacts for one of the two Atari XE keyboards made, that gets rid of the mushy feeling XE key caps. Roy purchased a set of XE Touch contacts. "Much better! almost feels like the old IBM XT keyboard." This is Roy's second feed back comment to Best. Roy L. of CA A few months ago, Roy picked up from Best one of the rare Atari 400 Factory 48K Ram upgrades and successfully installed in his Atari 400 computer (that was connected up to his TV via an Atari RF cable and TV switch box). Then he was considering getting an reconditioned Atari 130XE from Best. A few E-Mails back and forth, Roy put in an order for a Best reconditioned Atari 130XE computers. At the same time Best suggested to Roy, that he dump the Atari RF cable and old style TV switch box (that comes with the 130XE) and go with Best Enhanced Atari Composite Video cable for a better / clearer 130XE display. "I’m loving the 130XE (although my 400 is lonely now). I could have bought it for less than 1/2 the price on Amazon or EBay but I wouldn’t have had confidence in the condition, the seller or the machine’s history. You guys did the self-tests, put in a new upgradeable keyboard and even added the video cable that I didn’t even think about so I had confidence that I was buying the best 30-year old machine I could." Owen S. of CO "I received my 130XE, enhanced composite video cable, Best Electronics upgraded CX40 joystick, and Eastern Front and Star Raiders cartridges yesterday! Thank you so much for getting this package out to me in a expedient manner (placed order Friday p.m. and it was shipped that afternoon/evening!!!). Best Electronics rocks: with courtesy, service and breadth & depth of in-stock products, you have more than earned my business!" Paul J. of Canada Paul contacted Best via E-Mail. Several E-Mails back and forth, Atari questions asked and answered. Paul placed his very 1st Atari order with Best. "Thanks - We received the shipment yesterday! The new drive belt is installed and my 1050 drive works like it was 1985 again. I am sure it will run for another 35 years! The new 130xe main board also works perfect. I can honestly say Best rescued both items from the landfill. Thanks for helping persevere a little bit of Atari computing history in our home! I can say with 100% assurance that we will be back for additional purchases. Best is the best! Thanks Again!" Ted S. of Canada Ted contacted Best looking for 2 1050 Disk Drive Tandon replacement top head pads. Best told Ted we have them in stock. He second E-Mail back to Best, said he was also looking for a second complete Atari 130XE Computer to back up his second bad Atari 130XE Computer he had. We told Ted we do have Reconditioned Atari 130XE US / NTSC Computers in stock, but we had a lot more cost effective choice for him. Best has New complete drop in replacement Atari 130XE US / NTSC motherboards for far less than a complete Reconditioned 130XE Computer. "I received the package today. My 1050 Disk Drive now appears to be 100% operational again. The 130XE motherboard was very easy to install and is working great. Thanks again for staying in business for us atari addicts!" Special One Time Buy! Atari Service Center 130XE Plug in Diagnostic Test Board (plugs into the 130XE Cartridge and Expansion ports) and 130XE Buss line(s) Status indicator only. This Atari Service Center Tool is one step above of the normal Atari XL and 130XE Diagnostic Cartridge, CB101048. 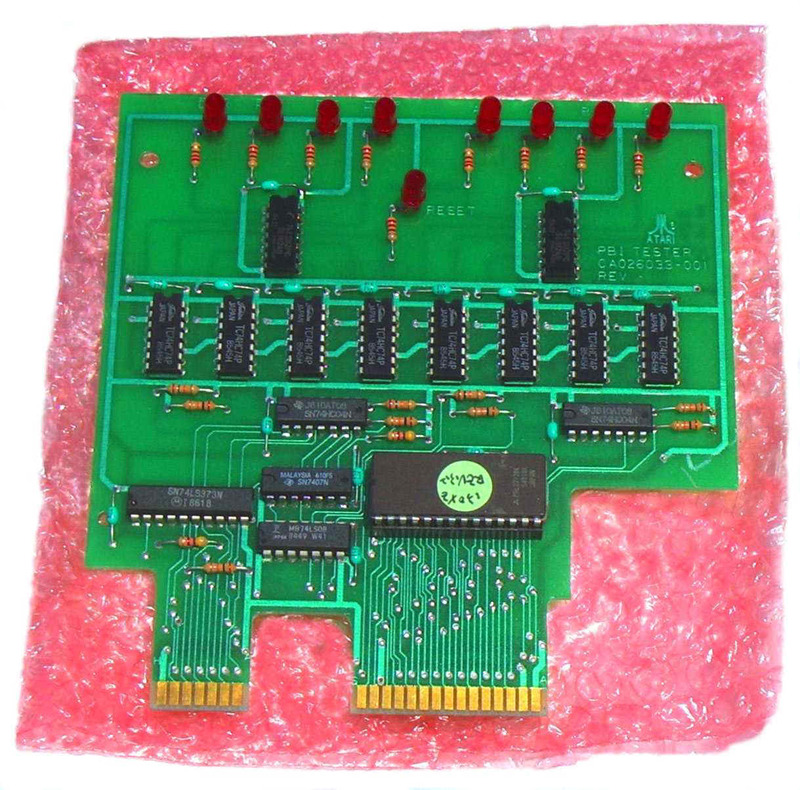 The 130XE Buss Diagnostic board plugs into the rear 130XE cartridge port and the expansion port connectors at the same time. 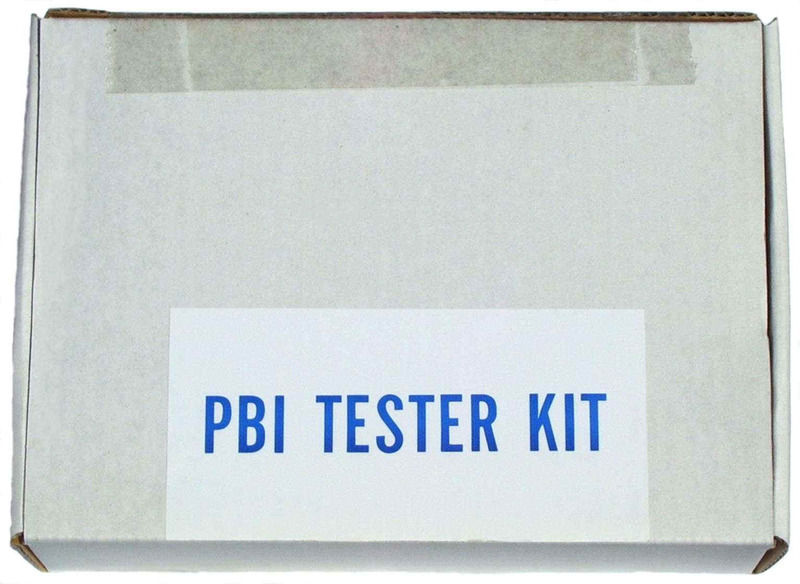 It has the same tests as the above CB101048 XL/XE Diagnostic cartridge plus also has 9 Red LED’s indicate the 130XE buss status (DIXX, REF, IRQ, HALT, A14, A15, R/W, O2 and RESET) of the 130XE motherboard. So these 130XE Motherboard buss functions can be checked using the Atari 130XE PBI Diagnostic card without the normal use of an Oscilloscope. It will check the 130XE internal buss status on a working Atari 130XE or a Dead Atari 130XE (no video display). Nathan B. of Australia Nathan was repairing his Atari XEGS console. He ordered a new replacement Atari XE Keyboard and the Best's XE Touch XE keyboard Internal Upgrade contacts. Best made sure that the XE version Keyboard (2 different version available) we sent Nathan was the one that could be upgraded with XE Touch upgrade contacts. "Thanks so much for the brand new XE keyboard and the XE touch rubbers. They arrived some time last week and after fixing up the keyboard my XEGS now feels like a brand new machine. It will be something to show off at the next retro computer meet up. The Atari community is really lucky to have someone as dedicated as you are to the brand. Congrats for being around for as long as you have been!" XE Game Machine The Best XE Touch (Formally called “TT” Touch for XE computers) Improved Silicone Cups That replaces the existing spongy / mushy feeling cups inside the XE Keyboard to give you a firm feeling keyboard with tactile feed back on each key stroke. XE Touch will only fit two out of the three versions / brand Atari Keyboards used on the XE Series Computers. If your XE keyboard DOES NOT have spring under each key cap, then you have the right XE keyboard that can be upgraded to “XE” Touch. All that is required for installation is a #0 Phillips screw driver Full set of 62 “XE” Touch Contacts. 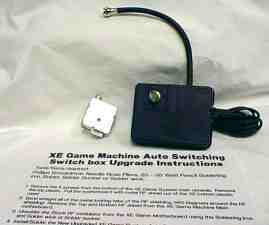 CB102117 $19.95 Now a Must Buy for every XE Game Machine Owner! One of our German Atari Customers (Marc B.) was so pleased with his upgraded (with Best XE Touch upgrade contacts) XE Game System Keyboard that he wrote quick install guide with pictures on upgrading his Atari XE Game System keyboard (same basic XE keyboard used in the Atari 65XE / 130XE computers). Here is the English translation provided to Best Electronics from Marc, of that install guide that will be published in one of the German Atari Magazines. The Atari CX77 Touch Tablet is an Art and Graphics Controller that is plugged into a Joystick port and designed for use with the Atari 8 bit Computers (400, 800, 600XL, 800XL,1200XL, 65XE, 130XE and XE Game machine). You can Draw or Trace pictures with the CX77 Stylus, a pen or even your finger. You have your choice of 8 brush widths with 128 Computer Generated Colors with 8 brightness levels. Create Automatic Circles, Squares, Discs, Boxes, draw perfect Circles, Squares, Rays and Straight lines, draw a series of Connected Straight lines, Mirror Images, Fill objects, Erase objects, Magnify to eight times normal size any portion of your Atari Touch Tablet Drawings. Pictures drawn on your Atari CX77 Touch Tablet can be saved to an Atari Cassette or Atari 810, 1050 or XF551 Disk Drive. You can also load The Popular Micro Illustrator Program drawn Pictures on the CX77 Touch. Old Atari 8 Bit Owners will remember the early Kola Drawing Pad with the smaller drawing surface. 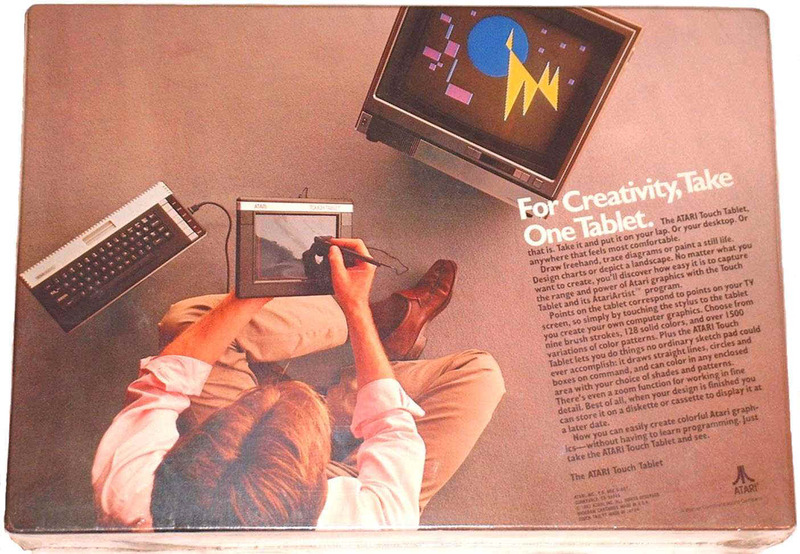 The Atari CX77 Touch Tablet was Atari's Answer to the Kola Pad a couple of years latter with many New Improvements over the original Kola Drawing Pad. The only draw back with the Atari CX77 was when they were released 10 to 15 years ago, they were always in short supply in the US. Many Atari 8 bit uses never saw one or only saw pictures of them only. We found these Rare New Atari CX77 Touch Tablets in an Atari Warehouse in Holland. The labels on the Pallets of them, said they came from the Atari Warehouse in Italy!! Best Electronics spent the time and money and re-imported then back into our US Warehouse from Holland. 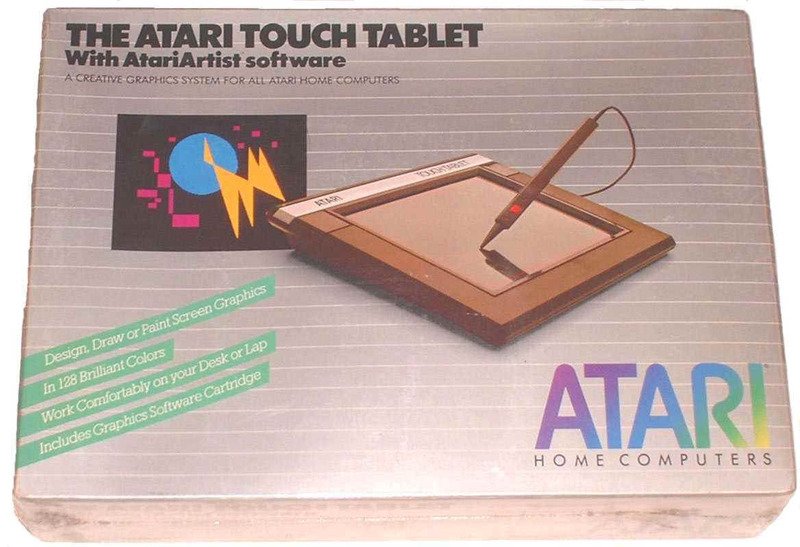 The Atari CX77 Touch Tablet comes with Drawing pad surface Protective Mylar cover sheet (Spare Protective covers are available from Best), Stylus Pen, AtariArtisit Cartridge and 21 Page Owners Manuals. Michael P. of CA "Just wanted to let you know that I un-boxed the CX77 Touch tablet today and tried it out, and I'm a very happy customer. It's probably the first time in 30+ years that I've had something brand new and sealed from Atari. Really brought me back in time in a good way. And the product works great!" James R. of CA. Placing his 4th Atari order in a row in the last few months, this time James ordered a New in the box Atari CX77 Touch Tablet and the very hard to find New in the box last Generation made, Atari XC12 Program recorder. "Just wanted to drop you a note to let you know I received my latest order today - the touch tablet and program recorder. As always, I’m thrilled and so appreciative to you guys for keeping the brand alive. Love to share the happiness you guys provide."